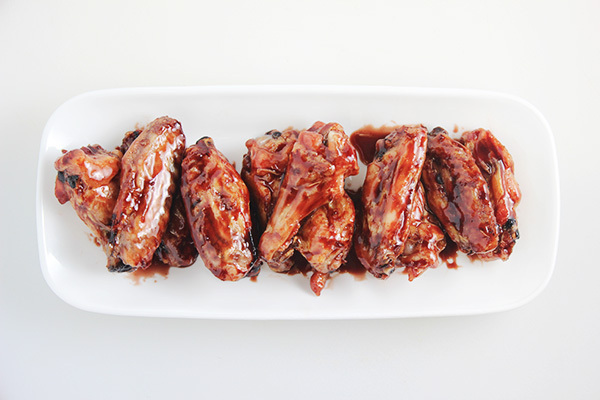 Football season means it’s chicken wings recipe season! 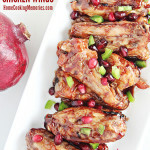 My easy Pomegranate Jalapeno Chicken Wings recipe is only 5 ingredients and full of delicious flavors from pomegranate juice, fresh jalapenos, and sweet honey! PIN THIS PHOTO to your CHICKEN RECIPE BOARD on PINTEREST! 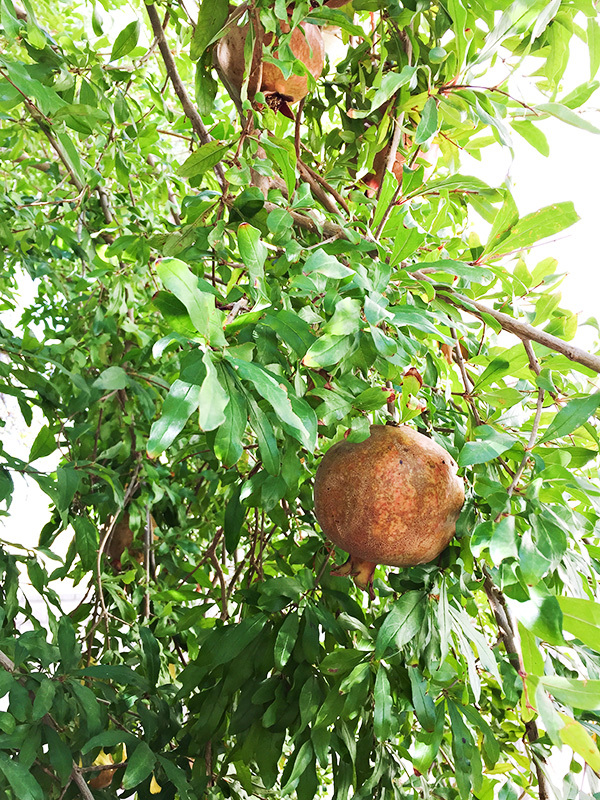 Last year, in my Orange and Pomegranate Salad recipe post, I shared the story of our pomegranate tree. 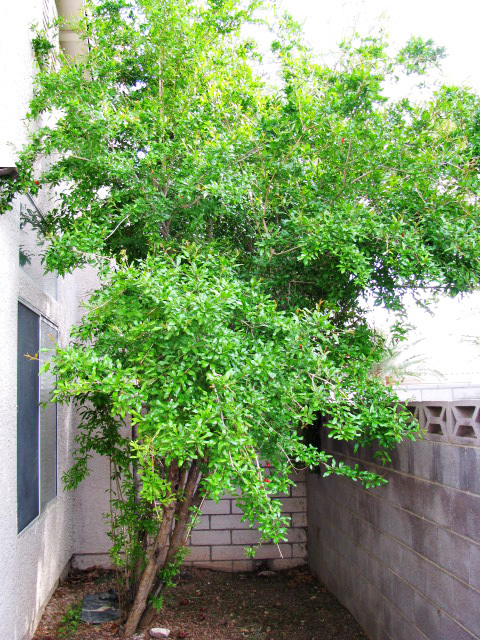 When I moved into our house, I was extremely excited that we had a fruit-bearing pomegranate tree on our side yard. At the end of that first summer, I loved pulling the pomegranates off the tree. There was SO many! I felt like I had won a pomegranate lottery. I’ve been hopeful that they would come back. And this year they did. Unfortunately, they are dry and not the beautiful red I was hoping for. Somewhat ugly. Not tasty at all. But, I see this as a challenge for the coming year. I’ve already started researching what I’ve done wrong and how I can make them better in 2016. Without being able to pull my own beautiful pomegranates off my tree, I still enjoy them by picking the up at the grocery store during the fall months. They can be expensive little suckers. But, worth it. 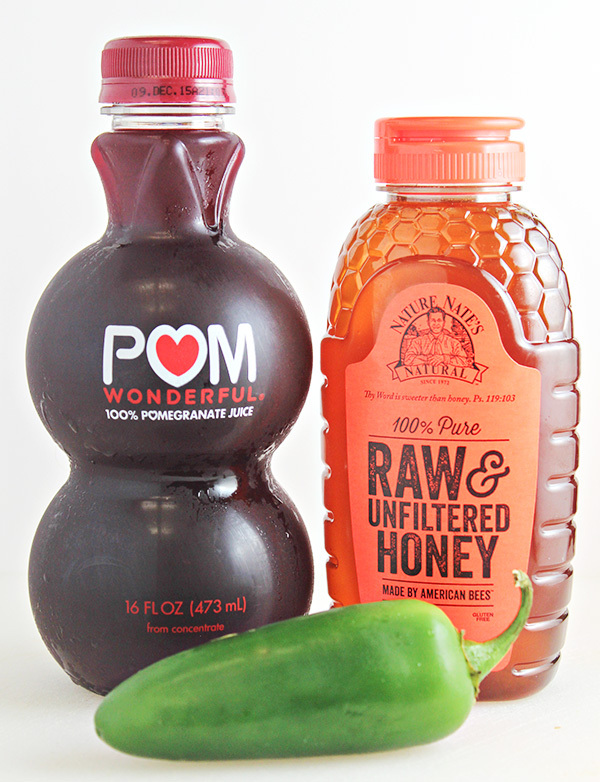 I also love that bottles of pomegranate juice, like POM Wonderful, are so readily available these days. Having a bottle of juice is a MUCH easier way to create recipes using pomegranates. And, with this being the season for pomegranates, I decided to it was time to start playing with it in some recipes. 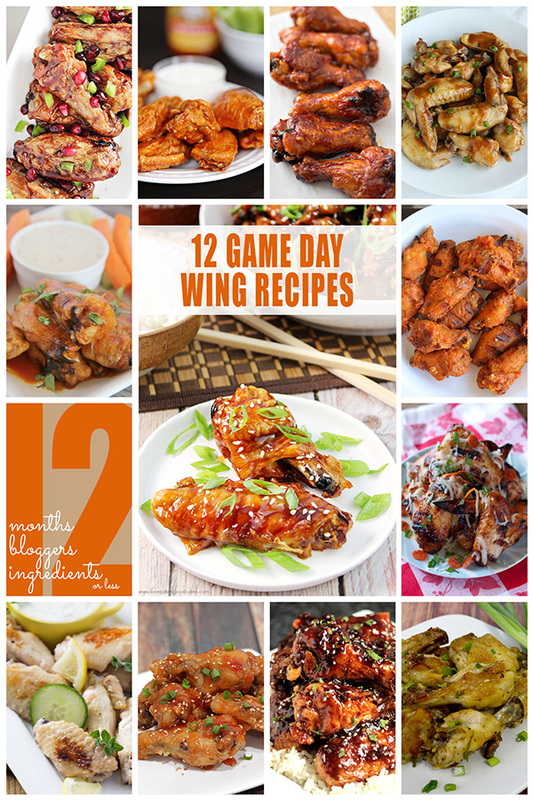 With football just getting started — the ultimate chicken wing season — it seemed only fitting that this months #12Bloggers theme was for Game Day Wings. 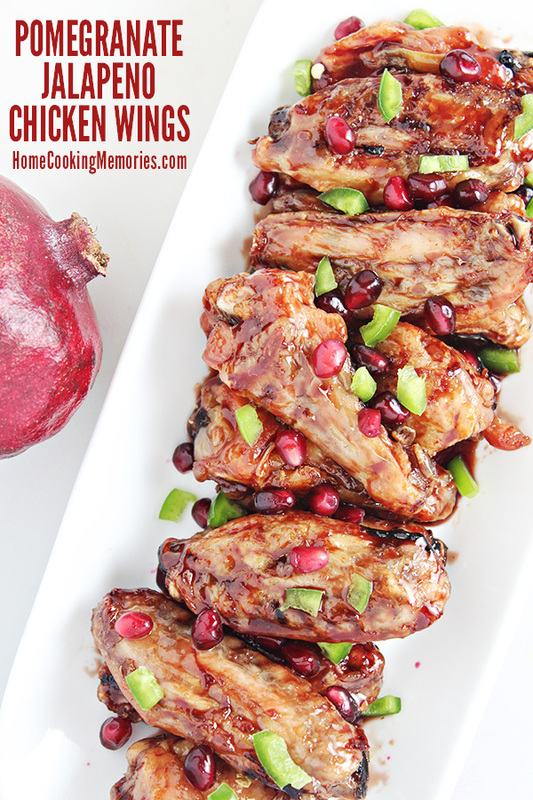 The combination of chicken wings and pomegranate sounded like a perfect union, so my contribution is my delicious Pomegranate Jalapeno Chicken Wings recipe. 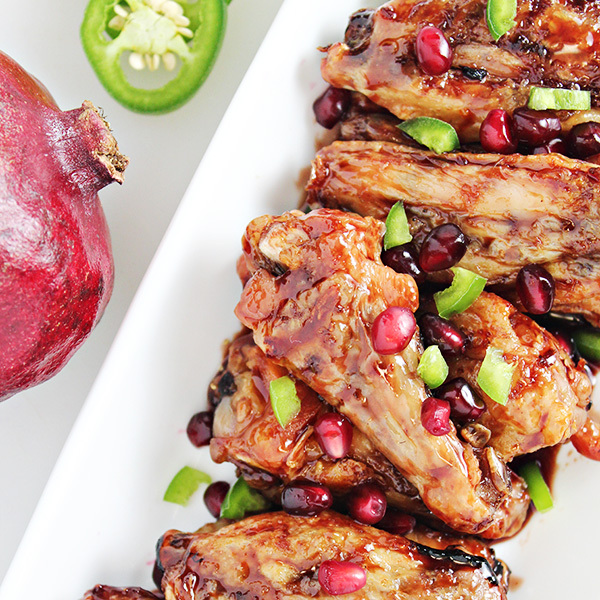 There is only 5 very simple ingredients in this Pomegranate Jalapeno Chicken Wings recipe: chicken wings, pomegranate juice, lemon juice, jalapenos, and honey. That’s it. The steps are easy too. 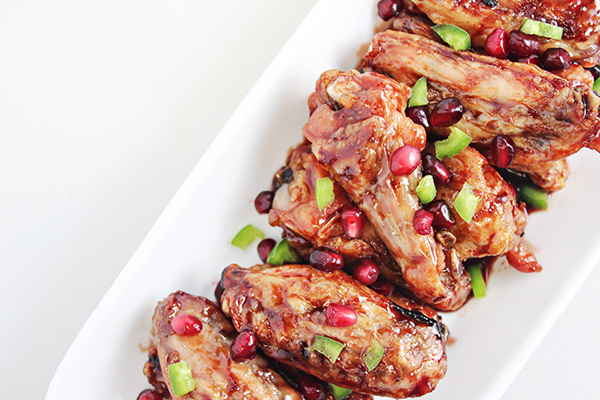 The pomegranate juice, lemon juice, jalapenos, and honey are simmered until they form a flavorful syrup, just right for tossing with the chicken. While the simmering can take a bit of time, it’s totally worth it. Luckily, as soon as they’re tossed, they are ready to enjoy. Of course, I had to fancy them up with some garnishes. A few pomegranate arils (seeds) and some chopped jalapeno added some fun pops of color. That’s totally optional though and I bet hungry football fans might not care about it looking all pretty. Preheat oven to 425 degrees F. Place wings on a greased baking sheet and cook in oven, skin side up, until crisply and cooked through and internal temperature reaches 165 degrees F (about about 20-25 minutes). In a small saucepan, combine pomegranate juice, lemon juice, jalapeno, and honey. Bring to boil, stirring until honey is blended into the other ingredients. Reduce to a low-medium simmer and cook, stirring occasionally, until mixture is thickened and about 1/2 cup remains. This process can take 40-50 minutes. With a slotted spoon, remove solid jalapeno pieces, press syrup from pieces with another spoon, and discard. 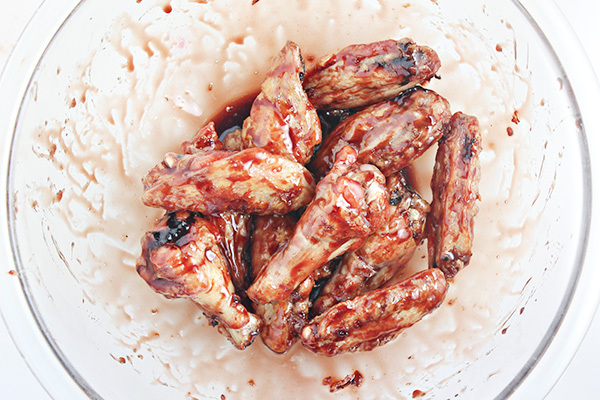 Place cooked chicken wings in a bowl. Pour sauce over chicken and gently toss chicken to combine with the syrup. Serve immediately. 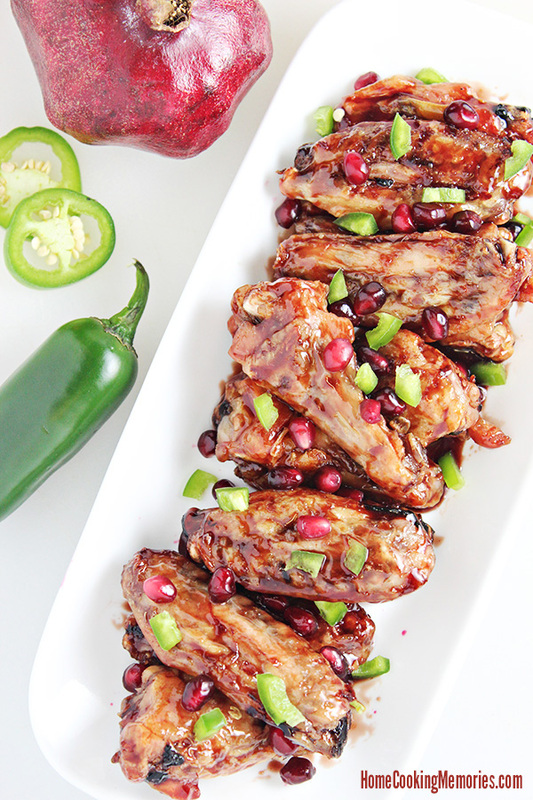 Garnish with pomegranate arils and chopped jalapenos, if desired. Frozen chicken wings can be used, if you wish. Cook according to package instructions. If you wish your wings to be spicier, cook jalapenos with the seeds in the juice. Thanks for linking up to last week’s Tasty Tuesday link up. I have added your recipe to the Tasty Tuesday Pinterest board. I hope that you’ll come back this week and link up some new recipes.